Mayor of Coldford, Jim Feltz, had given a lot to the city. The city was a demanding mistress though. It had earned its name as Shady City not just because of the gloomy weather but because everything was there for the taking by anyone not burdened by a moral compass. The mayor was such a man. Whilst the cities funds depleted he squirrelled away as much as he could. Things were going to implode soon. It was only a matter of time. The regeneration projects he had promised during his last campaign were halted. The poorest area of the city, known as The Shanties were now worse than when they started. People in high positions – people he considered friends – had pilfered the money away, leaving none for those lower on the ladder. There were no funds for expecting mothers he swore he would help and school budgets had been cut to the very brink. Only the exclusive school – Pettiwick – was managing to weather the storm but that was only because it’s rich students were willing to pay the cost in private donations but not many could afford to send their children there. What did it matter? When campaign time came again he could blame the opposition. After all he was just doing what he could with the mess his predecessors left behind. Half of the city would believe that and the other half wouldn’t care either way. He was done with all that. He checked his flight tickets again and stored them safely back in his pocket. The plan to leave everything behind had been in the works for some time. The day had finally come. He had enough money to start fresh. When the finances of the city finally tumbled like a house of cards he would be well out of the blast zone. His family would have to face the music at first but they would get out of it cleanly for the most part. His eldest daughter, Lacey, kissed him. Lacey was her father’s daughter. She was so like him in many respects. She had the same dark eyes and hair. She had the same permanent stern expression. She had gotten involved as his campaign manager the moment he announced he was running for City Office. She had aspirations of becoming mayor herself one day. She had a naïve view of politics though. A certain lack of compassion was required despite what many may argue. She would learn that soon enough. He stepped outside the building. People were becoming irate so he kept his security close. His silver town car wasn’t waiting for him. He trusted his driver, Shane. He had arranged to be taken to the airport rather than the office that morning and it wasn’t like Shane to be late. The mayor couldn’t help but worry something had gone wrong. He looked up at his security guard. He was expressionless. He stared straight ahead. He was much larger than the mayor in both height and girth. He had never bothered to learn the man’s name who’s duty it was to protect him. It didn’t seem important. His heart rate increased the tempo of its beat. It was really happening. The car approached the kerb. He couldn’t see Shane in the driver’s seat through the tinted windows. The security guard leaned forward and opened the door. The mayor made to climb in but he hesitated. A woman was sat waiting for him. She shifted over and patted the seat beside her. “Don’t be shy,” she said. Her ruby lips curled into a pretty smile. There was a gap in her front teeth that gave her a girlish quality. The collar of her grey coat had been pulled up around her neck. Jim took the seat. The door was closed and the car began to roll into movement. “Isn’t this cosy,” the woman remarked. He tried to control his breathing. He called upon every political stoicism he had in the hope he didn’t look worried. The woman looked out of the window, watching the city pass at greater and greater speed. Fear erupted inside him. He didn’t care he would be leaping from a moving vehicle. He clutched the door handle and pulled but it was locked. “Let me out!” he cried. Jim fell back onto his seat. Tears were in his eyes. His hands trembled. 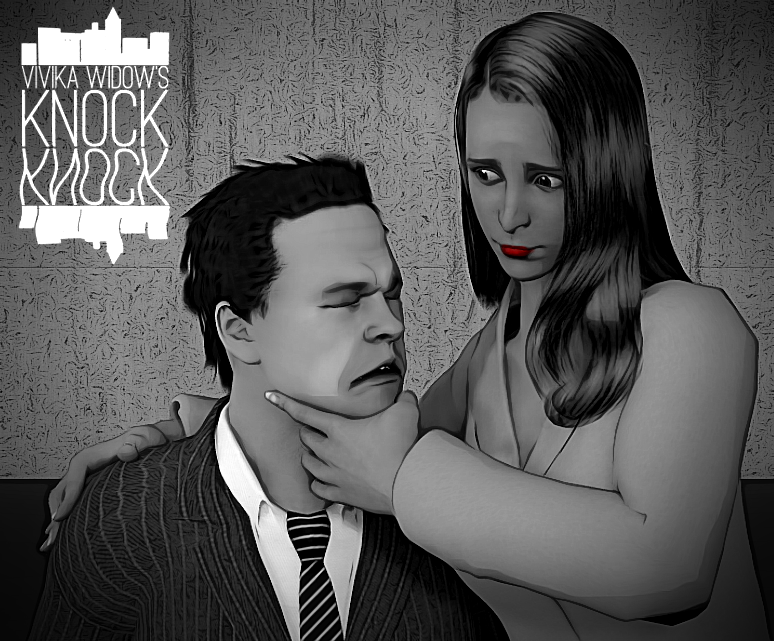 The entire Volume 1 of the Knock, Knock graphic novel is available to read HERE on Vivika Widow Online. Kindle Unlimited subscribers can also down load to kindle for free! Click HERE to download your copy.